Are you looking for remedies to get rid of kidney stones? Or are you looking for natural ways to lose weight effectively? Then you can try banana stem juice. It can help you lose excess weight. Research shows that banana stem has certain properties that help you lose weight. It is also found to be effective for preventing kidney stones. Banana stem contains a lot of important nutrients. Below is given the nutritional value of banana stem. All parts of banana are edible. In tropical countries like India people eat the fruit as well as the stem and flower of banana. The banana stem is botanically not a stem. It is a flower stalk. This stalk grows thick and is able to give support to the entire banana plant. It is the inside of this stalk that is consumed. The outer layers are discarded. The inside of this stalk is fibrous and edible. It has a crisp texture and mild taste. It is often used in savoury curries. It is also used as fried snacks. Banana is a rich source of potassium and vitamin B6. These are great for retaining muscle tone and for increasing the production of haemoglobin and insulin. This is the reason why diabetic patients and anaemic patients are asked to include banana stem in their regular diet. Weight loss takes place when you burn more calories than you take in. So, the food you eat has a great impact on your weight and how much weight you succeed in losing. Exercise also has a role in losing weight. As stated earlier, banana stem juice contains fibre in high amounts. It this fibre present in banana stem juice that makes it very effective for weight loss. Fibre helps in making you feel full for a long time, and at the same time you consume fewer calories. As you feel full, you can avoid eating too much of food. Below are given some facts about banana stem juice that may help you know about it better. Banana stem fibres constitute that part of the banana tree that your system cannot digest. This fibre helps in eliminating fat, as opposed to the fibre that lowers cholesterol. Fibres in banana stem juice make sure that the sugar and fats that are stored in the cells are released into your blood stream slowly. This way you get a steady supply of energy. If you exercise, this steady supply of energy will help in keeping you rejuvenated for a long time. It also helps in losing weight. As banana stem juice is low in calories, you can have it in plenty without the fear of taking in excess calories. It is recommended that you are to consume 25 gm of fibre daily. But you can consume 20 to 40 gm of fibre a day. You will be able to lose weight easily this way. In ayurveda, the ancient Indian medicinal text, it has been stated that banana stem juice is good for treating kidney stones. Now even scientific evidence supports this theory. 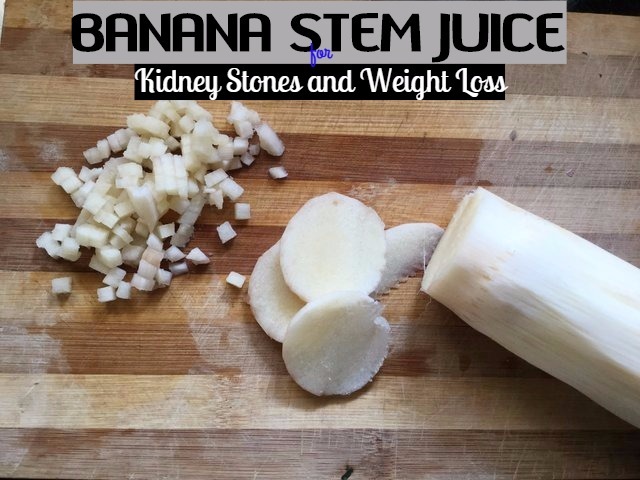 The diuretic properties of banana stem juice help in reducing the size of kidney stones. Scientists carried out an experiment, in which 30 rats were divided into 5 groups. Out of these 5 groups, one group was controlled, the second group was induced with hyperoxaluria with sodium glycolate, the third group was given banana stem extract and the fourth group was given both sodium glycolate and banana stem extract. The fifth group was given sodium glycolate in the beginning and then this was followed by banana stem extract. The urine of these rats were analysed for the next 24 hours from various levels of phosphorous, glycolic acid, glycoxylic acid and oxalate. This revealed that banana stem extract can treat patients with kidney stones. It was found that banana stem extract can bring about remarkable changes in the levels of these minerals in the liver tissue. So, banana stem extract is also good for treating gallstones. How to Make a Drink with Banana Stem Juice? Banana stem juice is not very delicious like other fruit juices. It can have a bland or sour taste. You can add other ingredients to banana stem juice and make it delicious. Here are some recipes you can follow. Soak the chopped banana stem in water. Now blend this in the blender in pulses. Strain using a fine mesh and then mix apple juice to it. Have it by adding a couple of ice cubes to it. Add buttermilk to chopped banana stem and keep it in the fridge overnight. In the morning you can add cinnamon and sugar and blend the soaked banana stem and buttermilk to get a thick shake. Soak banana stem in water for an hour, so that it becomes softer. Blend in the blender and sieve it using a fine mesh. You will get a pale, slightly yellowish juice. Now add lime juice to it. Add sugar and a pinch of salt and mix well. Mix jaljeera powder, sugar and lime juice to get a paste. Now mix in the banana stem juice slowly and make a homogeneous mixture. Pour the soda water and serve chilled or with ice cubes.